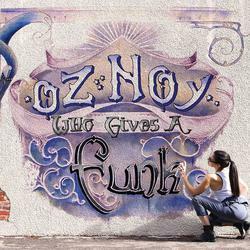 Internationally acclaimed guitarist and composer Oz Noy follows his provocative two-volume exploration and reinvention of his blues roots (Twisted Blues) with Who Gives a Funk - a examination of classic funk and R&B grooves, spiked with his uniquely unhinged improvisational instincts. "Simple, funky music - but soulful," is how Noy describes it, while acknowledging that simple is not synonymous with easy: The discipline and clarity these classic structures demand put even the finest musicians to the test, and Noy and his all-star cohorts deliver a remarkable program that uncovers intriguing new pathways through timeless forms. Inspired by the funk-blues nexus of the late '60s and early '70s music of artists like Freddie King, James Brown, Albert Collins, Who Gives a Funk mixes concise, compelling original compositions with reinterpretations of vintage standards by Brown, Jimi Hendrix, Sam Cook, Charles Mingus, and even Thelonious Monk - mostly tracked live in the studio for maximum grit and spark. A core group of New York's finest is augmented by an impressive array of guest appearances, including performances by John Medeski, Dweezil Zappa, funk pioneer Fred Wesley, Chris Potter, Robben Ford, Randy Brecker, Joe Bonamasa, members of Stevie Ray Vaughn's Double Trouble, and Living Color vocalist Corey Glover. Through it all, Noy's guitar is the connecting thread. Whether steering the band with incisive, stark rhythm work or soaring over the grooves with impeccable single-note leads that recall the graceful, nuanced inflection of a fine soul vocalist, Noy brilliantly walks a musical tightrope spanning the best of the past and the future. Surprising, danceable, and accessible, Who Gives a Funk is a powerfully heartfelt new statement from one of contemporary guitar's great improvisational stylists.